While the rapid evolution of modern medicine offers innovations in patient care, the resulting advancements are placing a fair amount of stress on our existing service delivery and payment models. A prime example is orphan drugs — defined by the FDA as drugs and biologics for the safe and effective treatment, diagnosis or prevention of rare diseases/disorders that affect fewer than 200,000 people in the U.S., or that affect more than 200,000 persons but are not expected to recover the costs of developing and marketing a treatment drug. Not surprisingly, these extremely specialized specialty drugs come at a high cost — often in the $1 million ballpark for a single year of treatment. It’s hard enough to imagine, let alone deal with, a scenario involving one plan member, but what about paying for use of such a drug in expanded populations or for off-label conditions? 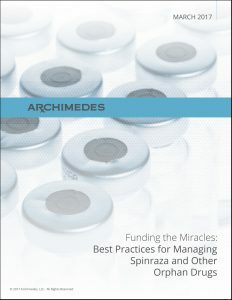 For valuable insight on this emerging issue, we encourage you to read a brief white paper from our specialty drug analytics partner, Archimedes. Using the recent approval of Spinraza™ in the treatment of adults and children with spinal muscular atrophy as an example, the piece explores the broader issue of orphan drugs and their potential impact on health plans like yours. It’s a thought-provoking look at one of the most difficult specialty drug management challenges before us, and definitely worth your time. Please let us know if you would like to learn more about Specialty Drug Management as it applies to your organization’s health plan.